Erin Bray, a professor of geography and environmental studies, joined CSUN to contribute to an increased focus on water science. Bray's research focuses on rivers, balancing the competing needs of human water supply with those of the natural ecosystem. Photo courtesy of Erin Bray. Priya Ganguli, a professor of geological sciences, joined CSUN as part of the university's focus on Water Science. 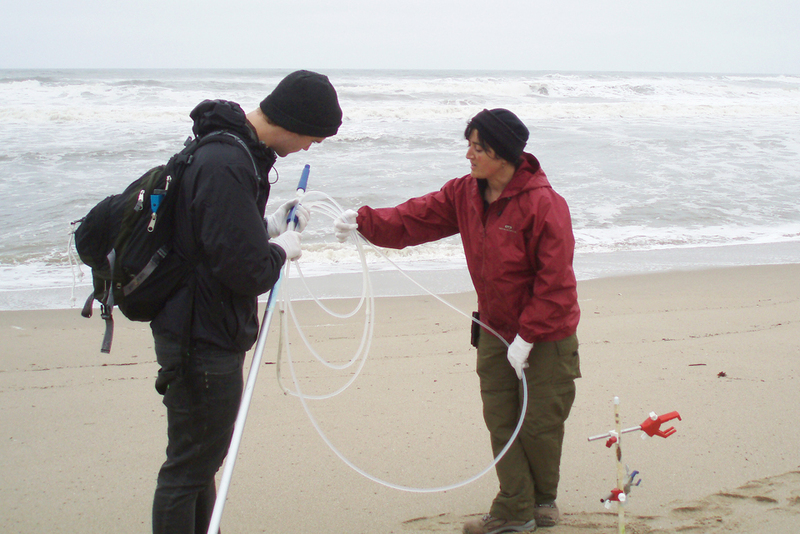 Ganguli, shown here collecting coastal water samples, studies how contaminants — especially mercury — travel through ecosystems. She is also interested in the long-term effects of environmental remediation projects. Photo courtesy of Priya Ganguli. Rachel Hohn, who worked with CSUN Water Science professor Priya Ganguli at Younger Lagoon in UC Santa Cruz, is joining Ganguli's lab as a master's student this year. Photo courtesy of Priya Ganguli. 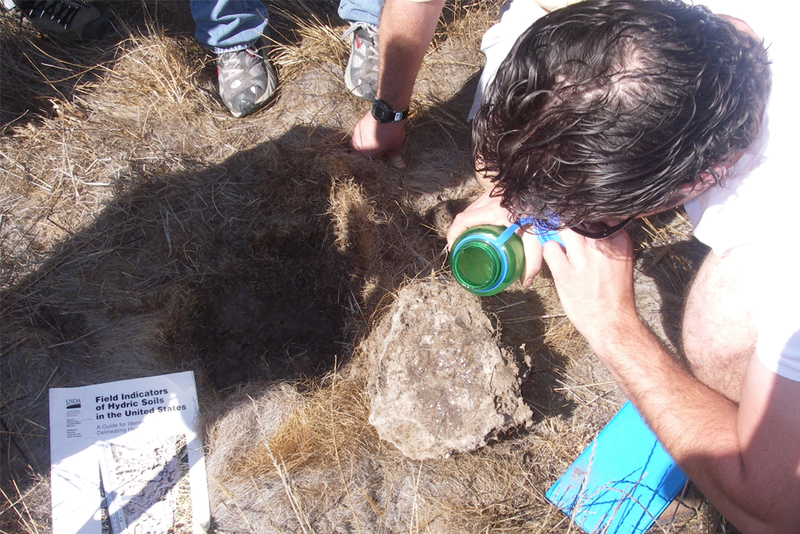 Center for Geospatial Science and Technology students and staff test for hydric soils in Santa Barbara. Photo courtesy of Danielle Bram. Students staff of the Center for Geospatial Science and Technology conduct research in Topanga Canyon. They were performing field validation work to verify wetland location and type. Photo courtesy of Danielle Bram. Students, faculty and staff across California State University, Northridge are conducting groundbreaking research and participating in innovative efforts to tackle one of the biggest challenges of the last several decades: water conservation. Cities around the globe, including Los Angeles, have implemented conservation campaigns to avoid running out of water, a resource that is increasingly scarce as urban populations boom and global temperatures rise. Earlier this year, Cape Town, South Africa, in the midst of a three-year drought, came within weeks of shutting off its taps and forcing residents to ration water — until conservation efforts delayed that dire scenario for at least another year. Similar situations could eventually play out in India, Iraq, Morocco and Spain, according to the Washington, D.C.-based global research organization the World Resources Institute. Located in Los Angeles — where conservation efforts continue even after California Gov. Jerry Brown declared the end of a three-year drought emergency — CSUN is in a prime position to be a global leader on water conservation. Dozens of CSUN faculty members and administrators have developed expertise in water issues across a wide range of disciplines. Civil engineering professors brainstorm water-saving designs, psychology professors consider ways to influence consumer water-use decisions and political scientists consider how research can be used to entice communities to invest in environmentally friendly projects. 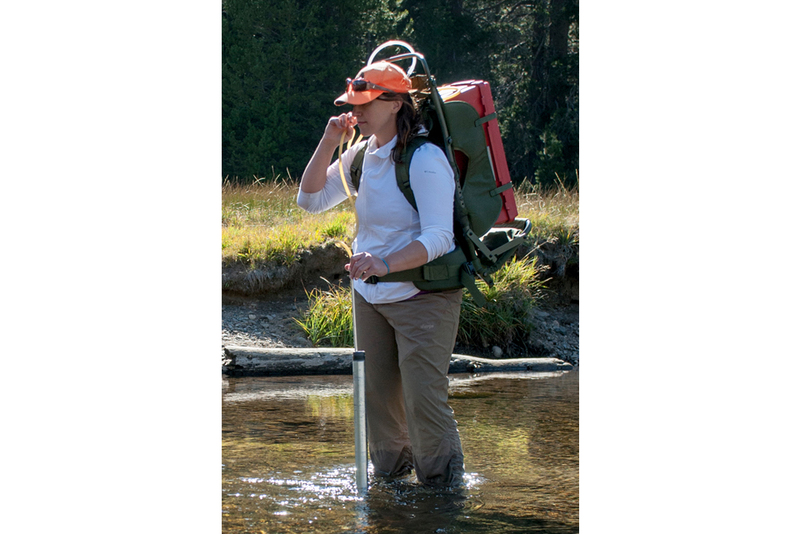 Water research touches nearly every academic department on campus, including geological sciences, geography and environmental studies, physics, chemistry, education, and environmental and occupational health. In 2017, CSUN demonstrated its commitment to the issue of water conservation with its inaugural cluster hire dedicated to water science. This new interdisciplinary focus on water science research started with two full-time tenure-track faculty positions — Erin Bray, a professor of geography and environmental studies, and Priya Ganguli, a professor of geological sciences, as well as a soon-to-be-added new engineering position — devoted to conducting water-related research and engaging with stakeholders across California and the western United States. The ultimate goal: using water science to inform conservation policy. CSUN’s cross-disciplinary experts, including the new Water Science faculty members, meet about once a semester to discuss ongoing projects and water-related news. The group is facilitated by administrators in Tseng College, including Joyce Feucht-Haviar, university senior international officer and dean, and Sherry Sidick, associate director of external relations. “Given the relevance and connection of the field of water to diverse departments and disciplines at CSUN, it was important to create a group of faculty from across the university to foster collaboration,” Feucht-Haviar said. “Research across fields and disciplines can inform and guide choices and strategies to benefit the region and state. In that light, CSUN is committed to providing forefront education for those in influential roles in this area. 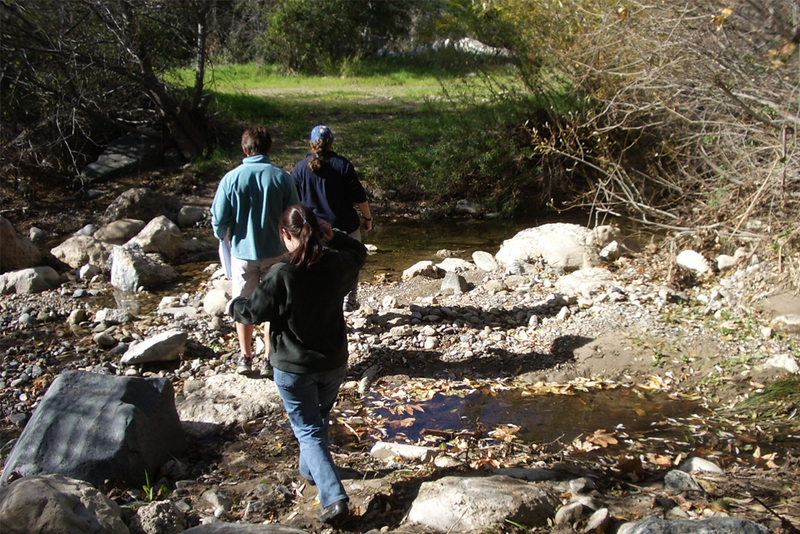 CSUN faculty and staff have existing water-related community partnerships that give students real-world experience and contribute to beneficial water management efforts. CSUN’s Center for Geospatial Science and Technology has contracts with key resource agencies, such as the California Department of Water Resources on a project to update maps of all surface water features in the state, as well as a similar project for the US Forest Service focusing on the southwestern United States, said Danielle Bram, the center’s director. The CSUN water group meeting evolved as a way to identify more partnerships, originating from an invitation from Sidick to members of the city of Los Angeles’ One Water LA team to meet with campus experts in fall 2017 to explore the possibilities of working together to meet common goals. This included CSUN faculty possibly assisting with preparation of the One Water LA 2040 Plan, a city strategic plan aimed at providing a roadmap to fiscally responsible water planning solutions. One Water LA’s presentation to CSUN researchers included bullet points of its research needs, and requested proposals from anyone in the room with expertise in those areas. CSUN experts now hold regular cross-disciplinary meetings, where faculty, staff and administrators can discover opportunities to work together on projects requiring various fields of expertise, potentially opening up the possibility of shared grants. Meeting attendees also discuss the campus’ innovative sustainability and conservation measures, many of which are spearheaded by the CSUN Institute for Sustainability. In 2013, the Institute for Sustainability finalized the CSUN Sustainability Plan, which established 10 key areas of focus for improvements including water conservation; the campus is working towards a 15 percent reduction in water consumption by 2023, said Misha Kouzeh, the institute’s project coordinator. Erica Wohldmann, the institute’s interim director, said the campus offers research opportunities for water quality testing, drought tolerant planting, medicinal gardens and more. She worked with CSUN Facilities this summer to add an 850-gallon cistern at the Chicano House to catch rainfall and support campus irrigation. The two new water science researchers aim to further research and establish public and private partnerships to advance water-related policies. Ganguli, an assistant professor of geological sciences, studies how contaminants — especially mercury — travel through ecosystems. She also is interested in the long-term effects of environmental remediation projects, such as those in Malibu Lagoon and the New Idria Mercury Mine Superfund project. “Climate change has resulted in longer droughts, more severe rain events, and an increase in wildfires — these changes impact both the quantity and quality of water,” she said. 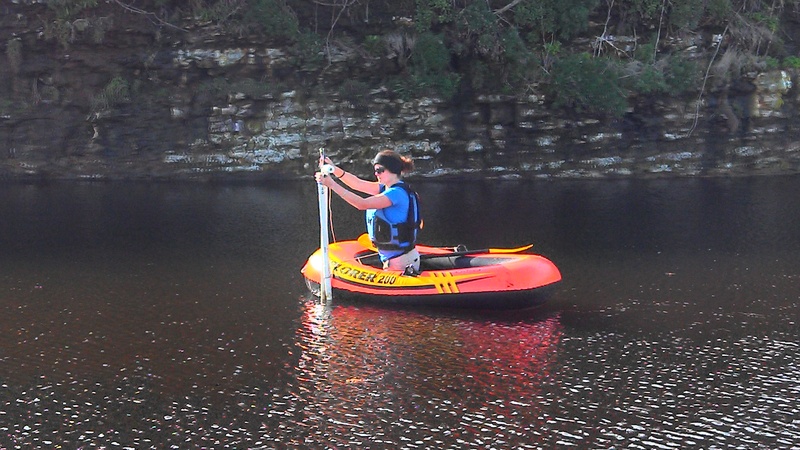 Bray, an assistant professor of geography and environmental studies, focuses on rivers, including how sediment moves, water temperature patterns and what features make riverbeds suitable habitat for fish and incubating fish eggs. Ganguli and Bray are establishing partnerships with individuals in departments across campus (such as political science, engineering, biology and health sciences) and with local stakeholders and environmental resource agencies to expand CSUN’s growing research presence. The water science professors, for example, are collaborating with professor Tyler Hughes in the Department of Political Science, who is working to understand how policies are implemented and to identify ways to better use science to inform policy debates. CSUN’s water-related research, which is conducted in collaboration with state, regional and even international organizations, helps prepare students for innovative careers, Feucht-Haviar said. Every semester, the Center for Geospatial Science and Technology utilizes about 15-20 students who perform the bulk of the project work. Hughes, the political science professor, is working with an undergraduate student to study the policy history of Malibu Lagoon, which will inform future coastal restoration projects. CSUN students also are able to volunteer for opportunities related to the Institute of Sustainability, including the annual Water Day event, which will next take place on March 26, 2019. Wohldmann received a grant from the Metropolitan Water District to explore the effectiveness for reducing irrigation water on turf grass fields by comparing biodegradable polymers to compost produced on campus from green waste. Students interested in assisting with this, and other projects, can contact the Institute for Sustainability. Ganguli chose to conduct her research at CSUN in part because the university values diversity and undergraduate research, and her projects always have benefitted from the work of undergraduate student assistants, she said. “My research is very applied. Therefore, the students I work with gain skills that give them a jump start for jobs in environment consulting and resource management, as well as research experience that makes them more competitive for graduate programs,” she said.